Geometry is just geometry, isn’t it? Why is there a distinction between geometries? What makes Sacred Geometry so sacred? In mathematics you can go in any direction with geometry, but every geometrical figure is created from a base. Actually, everything originates from a certain basis. Sacred geometry is the basis of everything that is. Everything? Why, then, do we not learn this? Because this knowledge has been hidden for a very long time and most of it is forgotten. The complete knowledge seemed to be taught only to Priests in the so-called Mystery Schools, somewhere around the time of the ancient Egyptians (1500 B.C.). So it’s ” sacred” knowledge. Unfortunately, we do not remember everything yet about sacred geometry and what is possible with it, but we are rediscovering more and more. Because geometry not only influences this dimension, but also other (higher) dimensions. There is a lot of information to be found about sacred geometry and there is also a lot to tell about it, a complete study if you ask me. 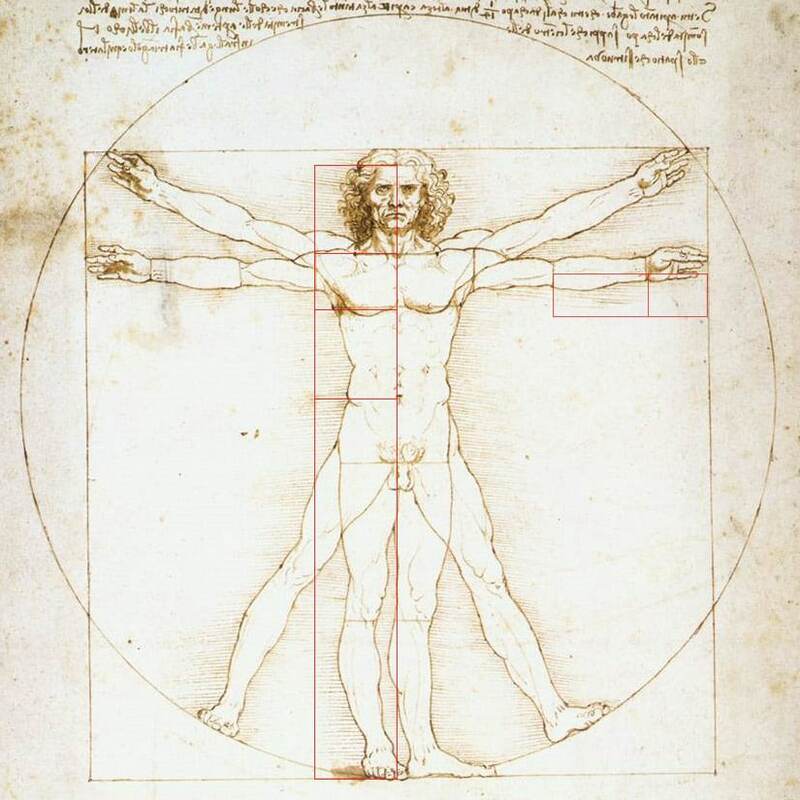 I wrote this blog to give some insight into why sacred geometry is so important. What is the basis of everything that is? Creation is the beginning of everything, without creation nothing can ever happen. In order to be able to create, consciousness is needed. Everything originated from consciousness according to the Mystery Schools. So there is a form of consciousness in the complete emptiness. Movement is not possible, because you can only observe movement when you can move relatively to or from something. The only thing that was possible was to expand, and that can be done in 6 directions. 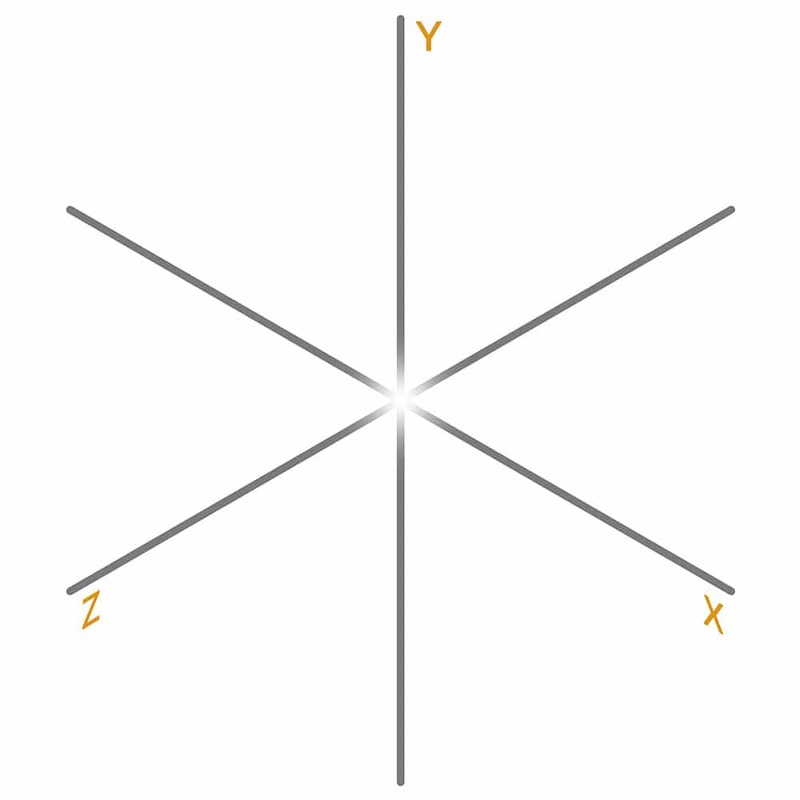 The X, Y & Z directions, also called forward, backward, left, right, up and down. By expanding in all 6 directions, space has been created. And in that space you can create further. By connecting all the ends of the directions, you create a figure, the octahedron. Movement is now possible, because there is an object where you can move relatively from one end to the other. Or you can move the object itself. By rotating the octahedron around one of its own axes, the points of the octahedron “draw” a circle. From this point on it becomes really interesting. In sacred geometry, all straight lines are male energy, and all curved lines are female energy. So first a masculine form was created after which a feminine form was created from the masculine form, quite similar to the story about Adam and Eve. The circle or sphere (seen in 3D) is the basis of all geometry and matter. Matter? Yes; protons, neutrons and electrons are spheres that together form an atom. A very simple example, but we will go into this in more detail. From the circle, all geometry can be further developed. Now we are going to do some complex stuff with circles, lots of circles. Because all these circles in the right proportion, are going to create the most important geometric shapes. We start simply, with two circles. When two circles of equal size overlap with the centers of both circles on each other’s outer edge, the Vesica Piscis is created. An important figure that is often used by churches and Freemasons, but also by the builders of the pyramid of Gizah and the Sphinx. 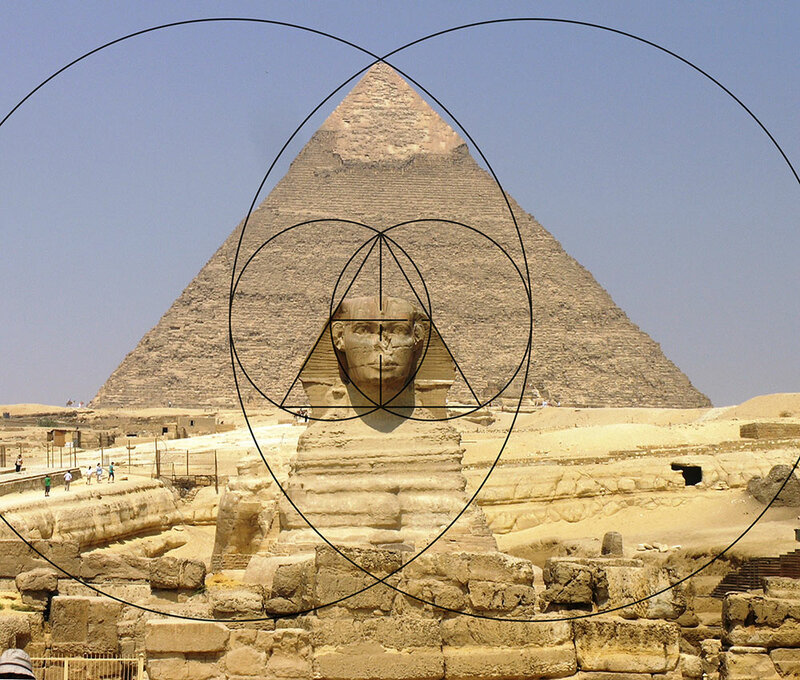 The ratio of the outside of the pyramid can be traced back to the Vesica Piscis, which is linked to the golden section (Golden ratio, φ). When the process is repeated with the number of circles placed, the “Seed of Life” is created. The Seed of Life is a figure consisting of 7 equal circles. When the correct lines are removed within the circles, the “Egg of Life” is created. The reason it is called the Egg of Life is because each fertilised egg with the first 8 cells of each living organism looks exactly like this. If we continue to place circles, the Seed of Life becomes the “Flower of Life”. One of the most important figures in sacred geometry. The Flower of Life is found all over the world in different temples. Among others in the temple of Seti I, the temple where Osiris has risen (resurrection) in Abydos. In different temples in Jerusalem and India and many more places in the world. All geometry can be traced back to the Flower of Life. From the Flower of Life, by removing the right lines again, the Fruit of Life can arise. When straight lines (male energy) are added to the Fruit of Life from the centers of the circles, Metatron’s Cube is created. 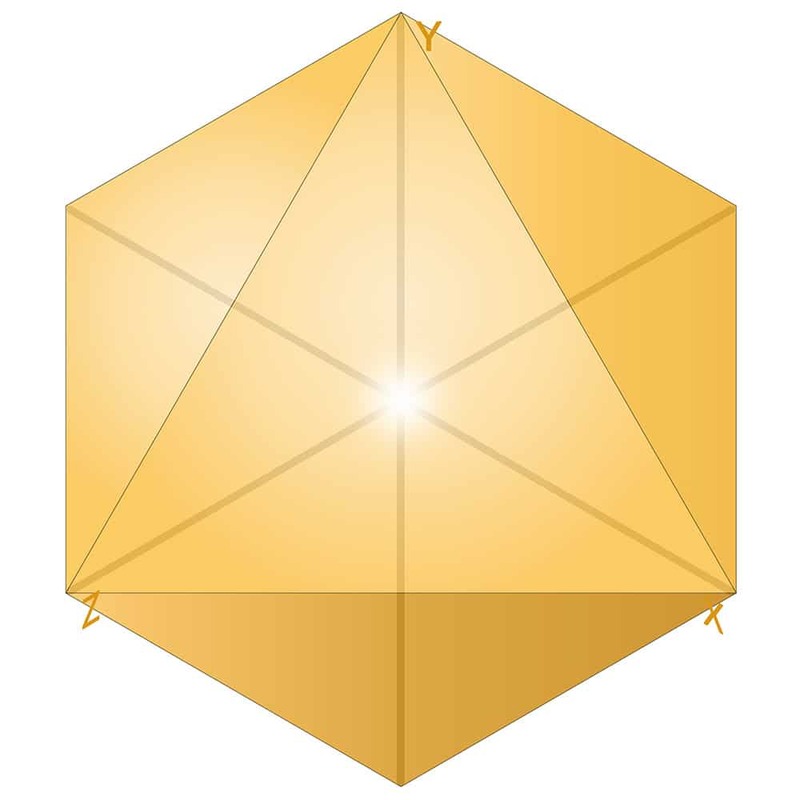 Metatron’s Cube contains the blueprints of all Platonic solids. In short, the Flower of Life contains; the Vesica Piscis + Golden Ratio, the Seed of Life, the Egg of Life, the Fruit of Life, Metatron’s Cube, all platonic solids and the Tree of Life as well. The most well-known platonic solid is the cube: all planes are the same (square), all edges are the same length and all angles between the planes are the same (in the case of the cube 90 degrees). 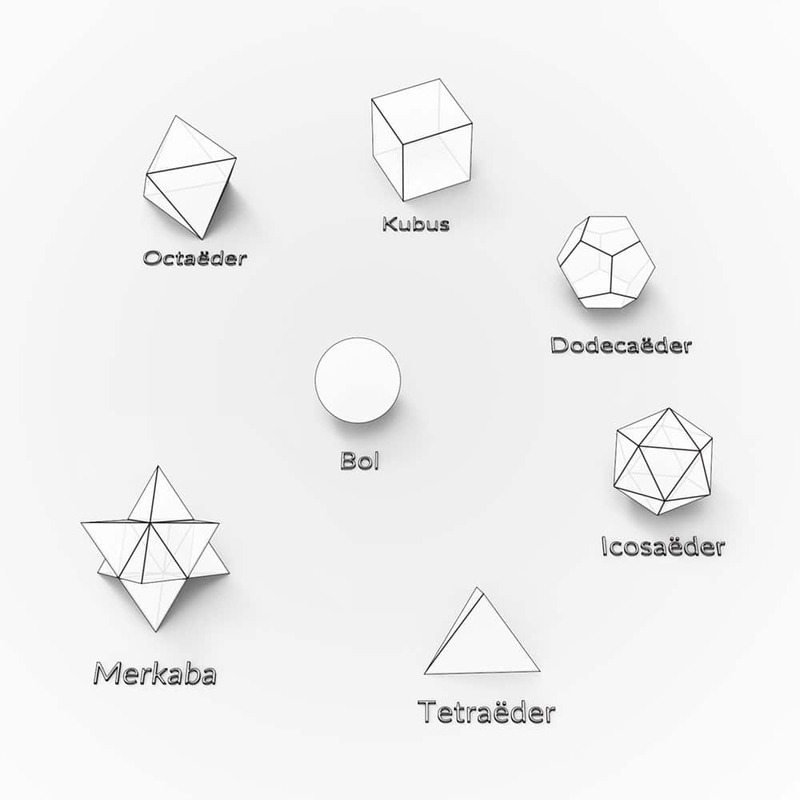 In total there are 5 Platonic solids; the tetrahedron, the cube, the octahedron, the dodecahedron and the icosahedron. Sometimes the merkaba and the sphere itself are also considered to be platonic solids. All these figures can be found in Metatron’s Cube, as 3D figures with a 2D view. The video below makes it a bit more clear how to find these figures. But these remarkable shapes are being dug up all over the world and are thousands of years older than Plato. The special thing about the platonic solids is that they represent every possible molecular connection and contain all possible geometrical laws of the reality and the universe in which we live, it is therefore the foundation of all physical matter. Now you might wonder, where can I see these figures in matter? Sometimes it can be seen with the naked eye, sometimes it requires a microscope. A good example is crystals and their growth patterns. 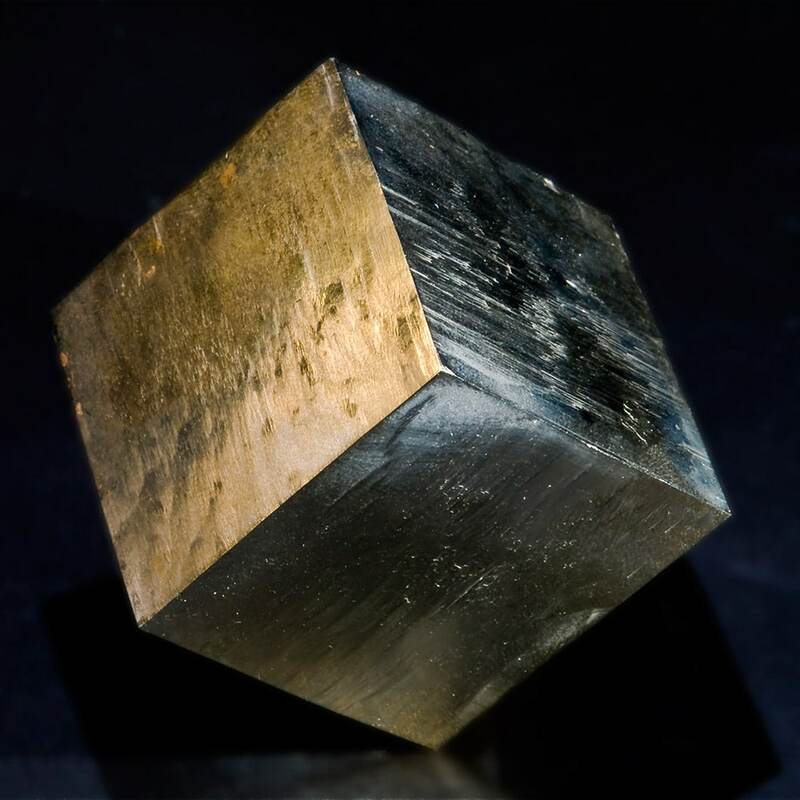 Fluorite or pyrite, for example, a gemstone that grows perfect cubes. Fluorite, for example, has an atomic structure of an octahedron. Which means that when the fluorite breaks, it breaks into perfect octahedrons. 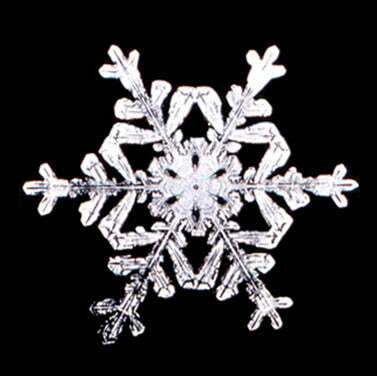 Or ice crystals that always grow perfect hexagons, the 2D view of a cube. 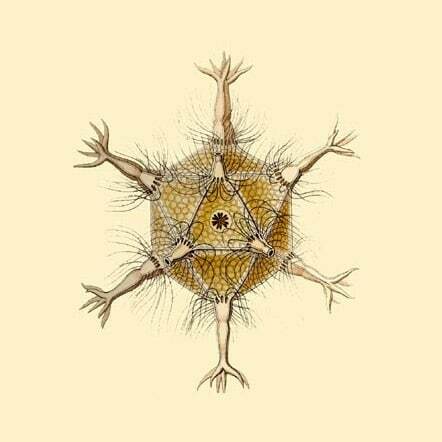 There are also life forms that have a perfect platonic solid as their body, such as Radiolaria. Small single-celled organisms, some of which have a perfect icosahedron as their body. Or a fertilised egg cell with 4 cells, together form a tetrahedron and with 8 cells a cube. 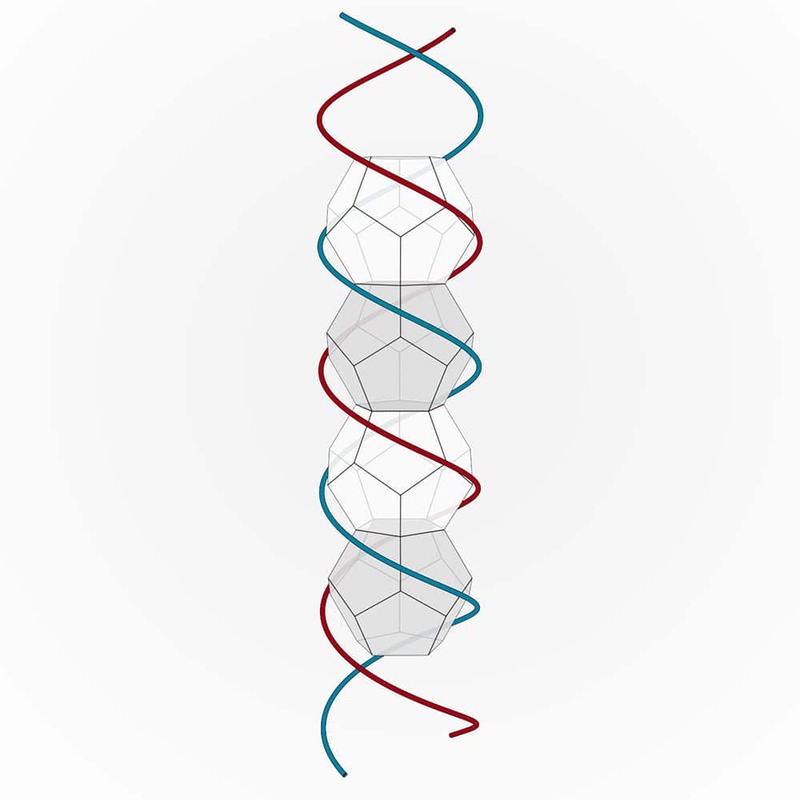 But also DNA, the blueprint of all life, is made up of several dodecahedrons that together form the spiral. We had already mentioned it a moment ago, the Golden Ratio. The golden section, Golden Ratio, Golden Mean, Divine Proportion, Phi, φ, are all names for the same, a ratio. And what about Fibonacci? That resembles it, but it is not the same thing. Phi(φ) is an infinite number, without a repetitive pattern (so completely random), comparable to Pi(π). Rounded off is φ; 1.61803398875… or also called 5^0.5 x 0.5 + 0.5. With this ratio we can make a Golden Ratio spiral. This spiral can continue indefinitely, both smaller and larger. Theoretically, this spiral has no beginning and no end. But what can we do with this ratio? The human brain is enormously attracted to this ratio and that is not surprising, because this ratio can be found everywhere. Our entire body, including organs, is made up of these proportions. And so too are bodies of animals, the entire nature of Earth and even our Universe, solar system, planets and Milky Ways. Take a look at our Pinterest page, there are a lot of nice examples. Because we are so attracted to this ratio, these ratios have also been incorporated into our art. As in buildings (Notre Dame, Greek Temples, the pyramid of Giza), paintings, sculptures etc. But nowadays the Golden Ratio is also used in company logos and other graphic designs. But especially the pyramid of Giza contains several special proportions. The pyramid builders knew exactly what they were doing, because not only the pyramid itself is a masterpiece, but also the alignment with the other pyramids is in relation to the stars (Orion’s belt, among others), the number of the speed of light and the Golden Ratio. 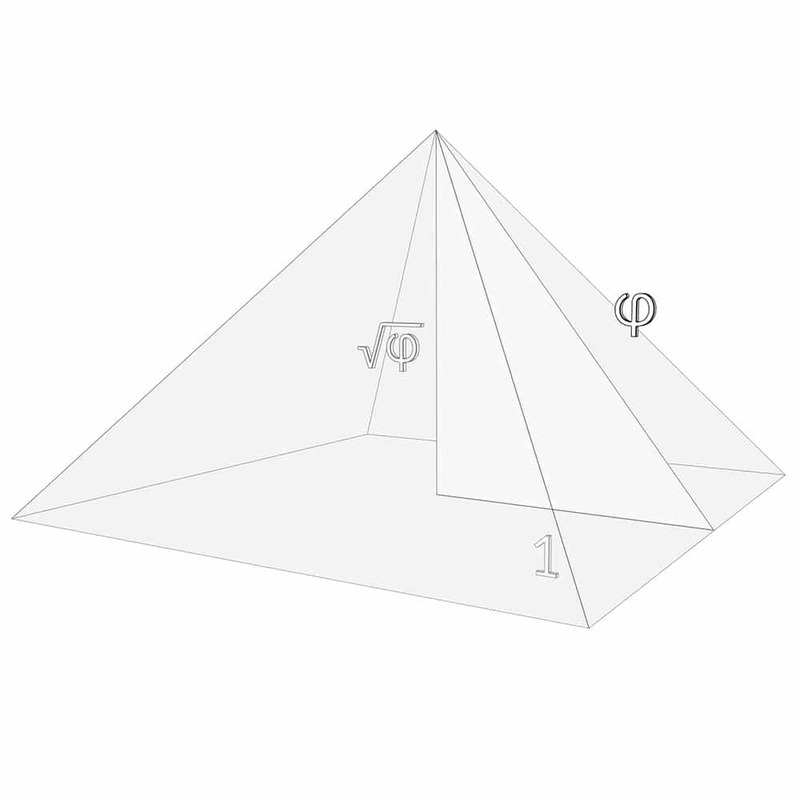 The pyramid of Giza has a Φ½, 1, Φ triangle ratio, the same ratio as the Earth and the Moon have to each other. A bizarre coincidence, which is no coincidence. Another master artist who also knew exactly what he was doing in his art is Leonardo Da Vinci (1452 – 1519). He incorporated so many proportions into his paintings that, after many years, every time something new is discovered in his art. To make a representation of how many proportions there are in his painting, below is an analysis of one of his paintings. But then the Fibonacci. Leonardo Fibonacci lived about 250 years earlier than Leonardo Da Vinci. Fibonacci discovered some interesting numerology. He saw that some lily species and irises had 3 petals. Butterflowers, delphiniums and akeletons had 5 petals and other species had 8 again. He discovered that there was a pattern in it, he called it the Fibonacci sequence. The series runs as follows: 1, 1, 2, 3, 5, 8, 13, 21, 34, 55, 89, 144, 233…. Etc. The series has a beginning, but no end. Each subsequent number is added together with the two previous numbers. The Golden Ratio is also infinite, but has no beginning and no end. And having no beginning, is something that nature (and our thinking pattern) has a lot of trouble with. 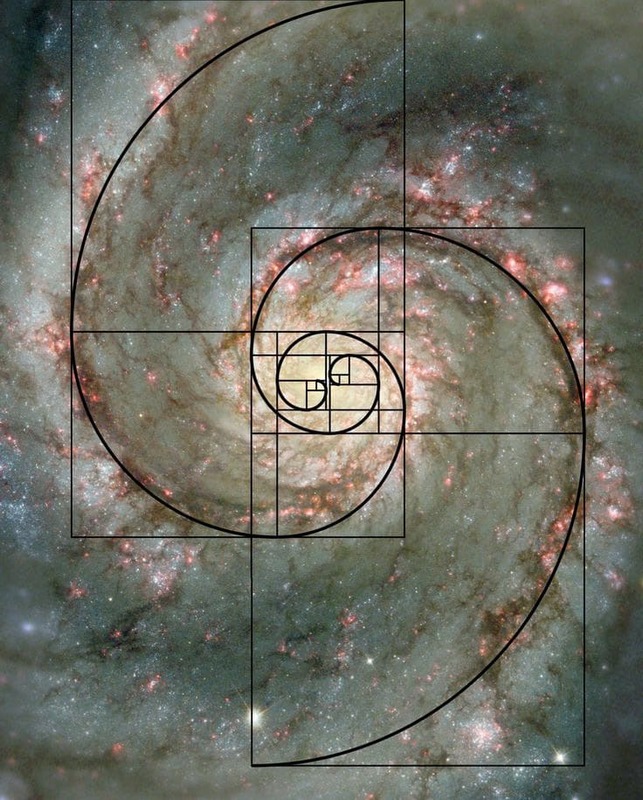 The Fibonacci sequence is the solution of nature on the Golden Ratio (φ). Now that the (different) proportions are visible, they can be compared with the Golden Ratio. To take you back, φ = 1,61803398875… As you may see, the ratio fluctuates enormously at the beginning of the sequence, from far below to far above the number φ. But these fluctuations become smaller and smaller as the sequence continues. If you had a graph made of this, the Fibonacci series will come increasingly closer to Phi, but will never be exactly the number. Phi is also seen as the divine number/ratio because almost everything in our reality tries to approach this ratio. A justified name for “sacred” geometry. It is probably obvious now that everything is connected when it comes to sacred geometry and has a great influence on us and our dimension. But sacred geometry goes beyond our dimension. It can create energy fields, attract vortexes and forms of consciousness. Maybe you have experienced this before, maybe you have not. I work a lot with sacred geometry and it strikes me that everyone feels attracted to another form of sacred geometry and in everyone’s case geometry does something different for everyone. Experiment with it, play and research it and above all, feel it. This is only a small grasp of sacred geometry. 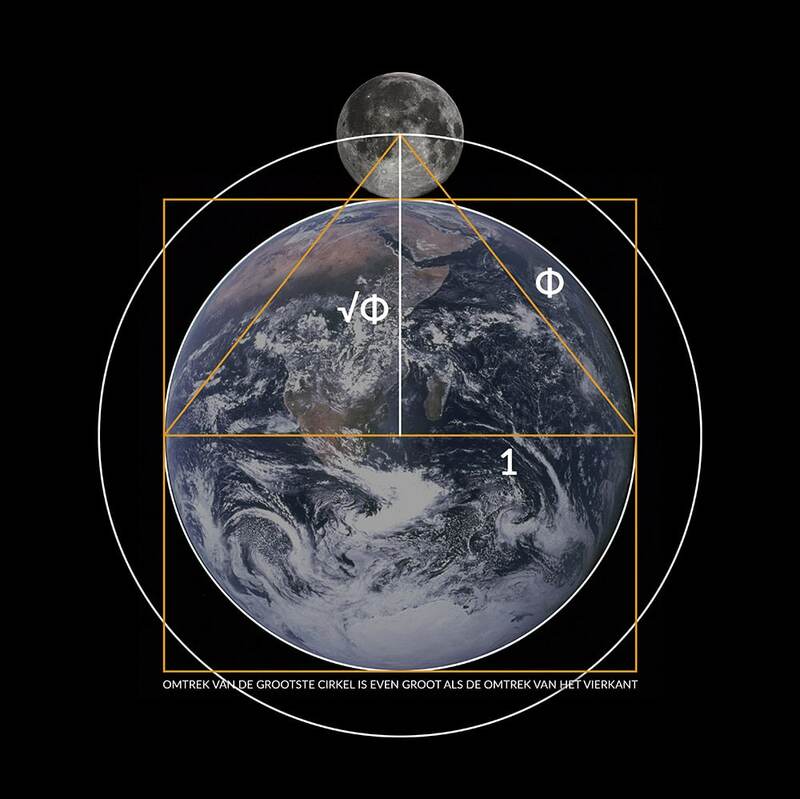 Posted in Sacred Geometry and tagged Fibonacci, Golden Ratio, Numerology, Vesica Piscis.